Tuesday night is meeting night at the San Francisco Board of Education, so Eric Mar will be there until midnight or later. That's no surprise as Mar, 42, is the board president. 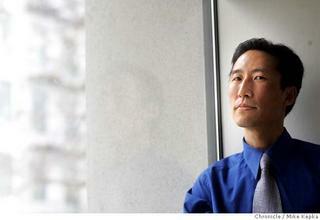 The surprise is that at 8 a.m. Wednesday, he'll be lecturing 50 or 150 undergraduates at San Francisco State University. Sacramento. My parents both worked for the state of California. Public schools through UC Davis. 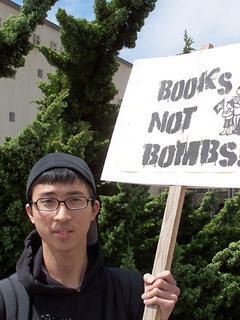 I teach Asian American Studies and Ethnic Studies at San Francisco State. Usually I have four classes a semester with a grading load of 240 students, and it's piles of papers. I also advise undergrads who want to be teachers. Do you tell them it's still a career worth going into? Yeah. I tell them that because my wife, Sandra Chin-Mar, is a teacher and I'm a teacher, that it's a noble profession. ERIC MAR was a sophomore at the University of California, Davis, in 1982, when he heard about the Detroit murder of 27-year-old Asian American engineer Vincent Chin. Chin was killed by two white, unemployed auto workers who blamed Asians for the decline of the U.S. auto industry. Chin's killers were let off, Mar recalls, with three months' probation and $3,000 fines. Mar, now associate director of the Northern California Coalition for Immigrant Rights, says it was then that he started making connections between the Chin murder and this country's historic scapegoating of immigrants and Asians as a whole for economic problems. It was a major turning point in his political life. "What struck me was, you could be of any class and be an Asian and could still be blamed ‹ and even killed ‹ for economic problems in this country," Mar recalls. "And I found it ironic that Chin was killed with a baseball bat outside of a McDonald's." These days if you get involved in grassroots politics in San Francisco, it won't be long before you run into the 35-year-old Mar, who has been at the forefront of local, state, and national battles to save bilingual education, reform local elections, and protect the rights of immigrants, among other issues. SF Schools: The Real Story on Superintendent Arlene Ackerman's resignation? To help folks get beyond the SF Chronicle’s propaganda and big business controlled mainstream media ‘spin’ on SF schools issues and the political drama around the 9/7/05 resignation of Superintendent Arlene Ackerman, we wanted to share a few alternative news sources that help fill in the holes left out by the mainstream press. San Francisco Magazine’s September 05 article by Berkeley investigative reporter Rob Waters tells the complex story of the differences [and common ground] between Superintendent Arlene Ackerman and SF Board of Education members, United Educators of SF leadership and teachers, and parent, community and student groups. The last few months have been one long schoolyard brawl for Arlene Ackerman, San Francisco's embattled superintendent of schools. She's no stranger to conflict, of course; her tenure here has been full of high drama. But during the spring and summer, tensions between her and most of the key players she deals with seemed to have reached the breaking point. Faced with declining enrollment and huge funding cuts, she and members of the Board of Education spent numerous meetings sniping at each other and agonizing over which schools to close and whom to lay off. Parents, teachers, custodians, and even kids alternated between begging the board to spare their school or job and blasting the superintendent and the board for their callousness and irresponsibility. Then things got personal. In June, former supervisor and mayoral wannabe Matt Gonzalez filed a lawsuit to void the rich new contract ($250,000 salary, $2,000-a-month housing allowance, and $375,000 severance package, even if she quits) that school board members—including one lame duck—awarded Ackerman late last year in an unusual, specially scheduled meeting. And it wasn't just Gonzalez who lashed out. Even high school students on the district's student advisory council voted 14-0 (with one abstention) to ask Ackerman to renegotiate her contract. Ackerman's response—more parental than professional—only inflamed matters. When she heard about what the students were up to, she tried to cancel their meeting. And after the vote, her public relations office put out a bizarre 30-page press packet denouncing the students and unnamed people for "using students to further adult political agendas." And then there's the gag order saga. Rumors that she had ordered district staff not to talk to reporters without permission blew into the open when teachers' union vice president Bradley Reeves told board members that the order was real and that district employees had been reprimanded for having unauthorized conversations. Ackerman supposedly got up and followed Reeves to the hallway, chastising him for his statement. Ackerman denies the entire incident, including the existence of any gag order, and she spoke graciously, and at length, for this article. But in June she told the Bay Guardian she would no longer grant the paper any interviews, and in late July, she announced that things had gotten so fractious around here that she was starting to think about quitting. “San Francisco Schools Chief Losing Support”Ohanian Comment: Why Is Corporate America Bashing Our Public Schools? provides information on what corporate-lead leadership in the San Francisco school had done to community-based programs before Ackerman arrived and a brief history of Ackerman's devotion to the test prep highway--in Washington D. C. and in San Francisco. ”If San Francisco schools chief Arlene Ackerman reveals this week she is leaving her post -- as many observers expect -- even some of her most avid supporters will agree it's time for her to leave. … "She probably needs to find another place to be at this point," said Novella Smith, a parent who served as campaign manager for Ackerman backer Jill Wynns' successful bid for re-election to the school board in November. "I don't think she has a choice," Smith said. "The silly nonsense is coming from every direction -- from her, too. It makes the children look mature." Pauline Vela, a member of Parents for Public Schools and Coleman Advocates for Children and Youth and a self-described busybody, said she no longer hears resounding support for Ackerman. "Very few parents I know would be shocked or saddened," she said of a potential departure. "For people, even some supporters of Ackerman, it will be a relief. People are just ready to say, 'Let's try somebody different.' "
Ackerman also has butted heads with the three over their support of Service Employees International Union 790, which represents custodians, secretaries and other school workers, and has scheduled a strike vote for Sept. 21-23 over their stalled contract negotiations with the district. Union members are upset that they last got a raise in July 2002 and don't get the same heath coverage for dependents as other district workers do. On Thursday, members of the union marched to Ackerman's office, where they chanted, "Arlene Ackerman, you can't hide! We can see your greedy side!" If the union does strike, it could be a joint walkout with the local teachers union, which also is in contract negotiations with the district. "It would certainly be very effective, and I think it's quite possible," said Dennis Kelly, president of the teachers union. Dennis Kelly, for one, isn't too bothered by the potential departure of Ackerman and the daunting task of finding her replacement. "I don't think the elected board is going to leave town, so I guess it's her turn," he said. "Superintendents come and go. The teachers, (classroom aides) and cockroaches -- we abide…." “The $400,000 spin machineWe've never found the folks on Ackerman's PR team helpful, but we didn't expect them to assert that SFUSD students are stupid. “Against all enemies: Ackerman's aversion to debate is making it harder for the school district to grapple with serious issues. SUPT. ARLENE Ackerman's long pattern of treating those who disagree with her as enemies has destroyed her relationships with key schools stakeholders and seriously restricted the district's ability to function. Ackerman's battles with the elected San Francisco Board of Education have grabbed headlines for years, but this year she has simply stopped coming to many meetings, offering her recommendations on complicated and controversial issues, or engaging in more than cursory conversations with board members. Lesser known but equally important is the devolution of her relationships with the teachers union, student groups like the Student Advisory Council, the Board of Supervisors, and the media (and not just the Bay Guardian, which Ackerman announced last week she would stop talking to). At the same time, Ackerman has strengthened her ties to groups that have overtly conservative political agendas, from SFSOS to the San Francisco Chamber of Commerce, which have become proxies in her political battles: staging press conferences and rallies on her behalf, blasting Ackerman's opponents in interviews and e-mail blitzes, and pumping up the indignation and turnout at public meetings. Lately, the situation has come to a head in the form of this striking dichotomy: Ackerman works well with conservative political groups that want to influence school policy but not with the teachers who do the day-to-day work of educating the students, or the school board members elected by the people to supervise her. 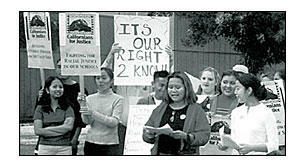 ..
Former student representative to the SF Board of Education Alan Wong gave his perspective on the conflicts with the Superintendent in the same June 29, 2005 issue. THE STIFLING OF dissent by some administrators of the San Francisco Unified School District has to stop. "Two years ago, I spoke during public comment at a school board meeting to criticize the unilateral firing of Student Advisory Council staff by the administration. The next day – during school time and without the consent of my parents – I sat in my principal's office for an hour and a half while I was questioned, advised to give more respect to Supt. Arlene Ackerman, and told to stay mum. How do staff members at my school have the right to tell me what not to say at a public meeting of the school board? And, 2 final articles I think help to frame the political differences and struggles that went on between the Superintendent and the various communities, teachers and workers in the SFUSD. In January 2005 when I became the President of the SF Board of Education – SF Bay Guardian reporter Tali Woodward covered the process I began to work with the Superintendent and others to bring more cohesion, focus and unity within the Board and our stakeholder groups in the District. New school board leaders want more openness and community input, but will the power shift lead Ackerman to leave S.F.? Eric Mar didn't waste any time before trying to set a new tone for the San Francisco Board of Education. Just seconds after his selection as board president Jan. 11, Mar said that because of budget cuts coming from the state, "I believe we have this urgency that requires the board to do everything possible to treat each other with respect and work closely together.... I know I will put differences aside – no bad feelings from the previous year or years." Mar and allies Mark Sanchez and Sarah Lipson have been in a running battle with the other three board veterans and the district superintendent Arlene Ackerman for the past few years. It's a struggle that long ago outgrew policy disagreements and became a clash of personalities. Although Mar and his allies often praise Ackerman for her accomplishments, they sometimes take issue with her proposals, or more frequently, with the way she makes major decisions before seeking community input. As a result, they've often been cast by the media and their political opponents as rabid antagonists of the superintendent who want her out of the San Francisco Unified School District. Lipson, Sanchez, and Mar maintain they've never wanted to force Ackerman out, and it's true that Ackerman has usually been the one to hint at her departure, telling reporters and others that she would rather resign than navigate a contentious relationship with the board. Now, with a key swing vote from new member Norman Yee, Mar will lead the school board. What does it mean for a body that's seen so much acrimony that its so-called rabble-rousers are now in control? Why are the mayor and school superintendent supporting the right-wing operatives at SFSOS? MAYOR GAVIN NEWSOM has preached ideological moderation since his ascension to Room 200, but he and other centrist political leaders continue to associate with scorched-earth political operatives bent on spending big money in stealthy and deceptive ways to demonize those on the left. A telling display of how downtown forces speak and flex their political muscle took place May 17 when the political advocacy group SFSOS held its third-anniversary luncheon at the headquarters of the Gap, followed by a fiery press conference slamming people who question whether school superintendent Arlene Ackerman's generous pay package was legally approved (see "Cutting the Golden Parachute," May 4). The ringmaster of this circus was SFSOS head Wade Randlett, who partnered up with Gap founder Don Fisher, financier Warren Hellman, and U.S. senator Dianne Feinstein to start SFSOS. ... Ackerman, on the other hand, warmly embraced a crowd that has been taking shots at the progressive members of the school board. "It's great to be in a room with friends. Sometimes I don't know where my friends are, but they're all here," she began. Ackerman then told a story about how earlier she had gotten pulled over for speeding and driving without a seat belt, only to have the cop recognize her and say, "You have one of the hardest jobs in the city. This ticket is on me." The crowd seemed to be eating up her self-martyring approach, so she continued, noting that before moving to San Francisco five years ago, she considered herself a liberal. But now, "I'm definitely to the right of everyone in this city," she said, drawing cheers from many Republicans in the room. To reinforce the point, she voiced her support for allowing children to attend their neighborhood schools and be subjected to a rigorous testing regime – both strongly pushed by SFSOS, which last year proposed a ballot measure to end school desegregation efforts but backed off in the face of criticism. Ackerman and her spokesperson Lorna Ho later denied that she used the term "neighborhood schools," insisting that she said only, "Every neighborhood deserves a quality school," but Ho didn't get us the tape by press time as she said she would. "Neighborhood schools" is a loaded term that is essentially the opposite of desegregation, which Ackerman told us she still supports, although she didn't voice that support to SFSOS. In fact, she didn't make any statements that differed from its agenda. "To be in a room where people care about you is really great," Ackerman enthused at the event, singling out her "partner and friend" Don Fisher for special appreciation. He spoke next, complaining about the political gains that the left was making in San Francisco three years ago. "So Wade came along and we formed the Committee on Jobs, er, uh, SFSOS," Fisher said, inadvertently referring to the other downtown political group he supports, which is more honest about its business community connections than SFSOS. As Ackerman waited inside the building, Randlett and company stepped outside for a full-throated defense of the new contract she was granted late last year by a lame-duck board, which is now being challenged on procedural grounds mostly because of its generous golden parachute. "They are trying to get rid of Arlene Ackerman," said Randlett who, like most, spoke in terms of an attack on Ackerman and children rather than about the narrower issue of her contract. … School board president Eric Mar said he was saddened to see school and city officials participating in the event. "I thought if we ignored them they'd go away, particularly after being discredited in the last election," Mar said of SFSOS. "By going to their luncheon, [Ackerman] is legitimizing them and making them seem like a credible group, as Newsom is as well." … Ackerman was defensive when we asked about her relationship with SFSOS, saying, "My agenda is to work with everybody." But when pressed on her feelings about SFSOS, its agenda, and why she didn't join the mayor in challenging their approach, she told us, "I don't view this group as you do. I see them as partners in making this a great school district." Wynns sees the relationship between Ackerman and SFSOS as benign, but Mar is concerned that the group has gotten Ackerman to stop making public statements in support of desegregation in exchange for their support on other issues. While Mar was restrained in his criticism, Board of Supervisors president Aaron Peskin blasted the group and the officials who showed up. He called SFSOS "a tattered group of Fisher-funded, disgruntled, mean-spirited, reactionary, ineffective people with an e-mail list...I don't see how any rational human being can even acknowledge their existence." He continued, "I think it's really sad for elected officials and civic officials to associate with anyone who wants to resegregate the schools and create regressive taxation." Peskin has differed publicly with Ackerman over her alliance with SFSOS and her refusal to return his phone calls to discuss the matter, a tiff that spilled over into a colorful exchange at a restaurant that made the May 15 Matier and Ross column in the Chronicle. "Arlene Ackerman is an idiot," Peskin told us. "She is politically naive and enamored with hanging out with rich people, and so she does what they tell her to do, whether it makes sense or not…." Kozol's Call to Action - teach-ins leading up to BROWN case anniv. May 17, 2006? Harold Berlak, a senior research fellow with the Applied Research Center in Oakland, was on KPFA radio [94.1FM] this morning [9/27/05] for their drive time public affairs program. Berlak is also a fellow at the Educational Policy Unit, Arizona State University . Like Jonathon Kozol, Berlak lamented the harm to schools caused by Bush's NCLB [No Child Left Behind] and the resegregation in urban school districts like SF, Oakland, LA, Richmond, etc. 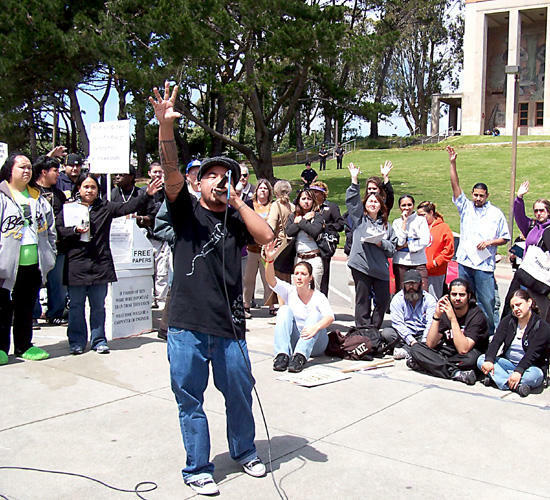 When KPFA host Andrea Lewis asked him what his solution was, Berlak called for a social movement of parents, teachers and community people to stand up to the high stakes testing regime and the big business driven 'standards movement'. He said we need 'teach-ins' to help inform and involve regular parents, teachers, students and community members about the federal and state laws and policies which are pushing working class and kids of color further and further behind. I have been talking with Berlak and others about coordinating a series of 'teach-ins' on educational inequality and conditions beginning in the Spring and building up to the anniversary of the BROWN v. BOARD OF EDUCATION case this coming May 17, 2006? Oakland communities held a teach-in and various rallies and demonstrations on the anniversary this past year. http://t4sj.org/. 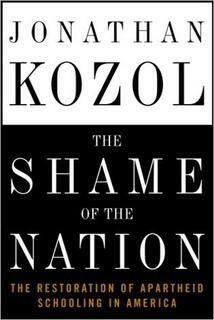 We hope to pick up on Kozol and Berlak's 'call to action' at that time as well. Q: What is the most effective way to begin challenging the status quo of segregated schools in our nation's largest cities? A: The only way that this will ever change is by the mobilization of millions of ethical Americans, whatever their political positions. The young idealists who I meet at colleges don't want to do something sweet like mentor an inner-city student. That's fine, but charity is not a substitute for systematic justice, and they know it. I want to see an upheaval of decent young people who have the courage to call reality by its real name, and then go out and fight like hell to change it. Q: You write that the funding of education should be a federal, not a state or local, responsibility. Why would this be a better approach? A: The present system of school finance is a hopeless mess and utterly inequitable. It depends on local property wealth, which makes it impossible to have a meritocracy. Even the state formulas that allegedly equalize funding never work. It's archaic and not in our national interest to leave the educational well-being of American citizens up to the whim or wealth of the village elders in some impoverished or wealthy town. We should scrap the entire system of school finance. All money for education in a democracy ought to come from the federal government. That's the only fair way to do it because districts and states are unequal. Kids don't go to school to be citizens of Oklahoma or Arkansas. They go to school to be Americans. at 555 Franklin Street, board meeting room. In Opposition to Proposition 74 – the "Punish New Teachers Act"
For future board of ed agendas click on the link below - because of the efforts of Sarah Lipson, Mark Sanchez and other board members - our agendas are now posted on the website usually on the Thursday preceeding the Tuesday board meetings [the board meets every 2nd and 4th Tuesday of the month, except in July]. Jonathan Kozol visited San Francisco's Tenderloin Elementary School on Wednesday to bring his urgent CALL TO ACTION to us [Progressive Commissioners Mark Sanchez and Sarah Lipson were in the front row, Vice President Norman Yee was in the back row with me and teacher and United Educators of SF Exec Board member Sandra Chin Mar, my partner]. Since his 1967 expose "Death at an Early Age" about his early experiences as a young teacher dealing the racism and class inequality in Boston's schools, Kozol has been unrelenting in his advocacy and expressions of moral outrage about the inequities in our country's schools. Now Kozol is on tour promoting his newest book The Shame of the Nation: the restoration of apartheid schooling in America. One thing I respect about Kozol is his courage in standing up to big business groups, opportunistic politicians and 'traveling charletans' passing themselves off as silver bullet education reformers. I also appreciate his progressive vision of what education should be and his sharp critique of high stakes testing and how it is ruining our education system, or as he says, causing "mental decapitation" of students as well as "fear among teachers" and principals "running scared" who want to resist but won't. "I don't want to get you into trouble, but I will help you cause trouble!" 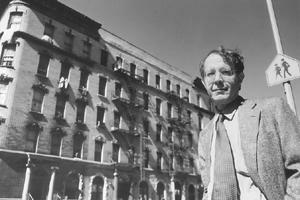 With the rightward direction in education that Bush and his Secretary Spellings and Arnold and his Secretary Riordan are steering us towards it seems to me that Kozol's call must be heard by many more to build the social movements we need to change the political course for our schools. JOIN THE CAMPAIGN FOR QUALITY EDUCATION AT BETTER SCHOOLS, AND A BETTER EXAM! Don’t block our futures with the exit exam! The exit exam shuts the doors on us and we want a new set of keys! Students, parents, and teachers unifying across L.A., raising their voices for a quality education for ALL! Students will be delivering hundreds of signatures on petitions to the Governor's office and demanding action! Joe Strummer must be rolling over in his grave. 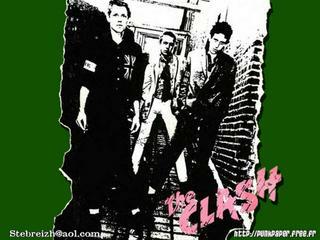 I've got the Clash's London Calling blasting on my high tech HDTV entertainment system in my top floor room here in the Mandarin 'Oriental' Hotel [18 months old and already being touted as one of Washington DC's fanciest hotels]. The room overlooks the Jefferson Memorial which lights up like a big nite-light over the Potomac River and the Tidal Basin not far from the White House. The SF Giants arrive today for a series with the WA Nationals, but that's not the reason I am here either. One of the world's richest men Eli Broad [82nd in the world, and 45th in the US according to Forbes] and his Broad Foundation have brought me and other school board presidents, superintendents, CEO's, and teachers union presidents out here to announce their Broad Prize - touted by the business community as the 'nobel' prize of urban school districts. Besides San Francisco, the other 4 urban school district finalists include Boston, NYC, Norfolk VA, and Aldine Texas [near Houston]. Boston has been a finalist 4 times already, Norfolk 3 times and Aldine 2 times. This is SF's first time as a finalist. Each finalist district will be receiving $100,000 of college scholarships and the big winner gets a half a million dollars. And lastly, see CEJ's Alex Caputo Pearl on Broad/Riordan and their impact on LA's schools and working class communities and targetting of liberal and progressive school board members. For a different analysis - Forbes did a feature on Broad called Educating Eli - 10/6/03 - www.forbes.com. We will find out who has won the Broad Prize at a press conference Tuesday morning with Bush's Education Secretary Margaret Spellings and others. EdTrust West's recent report on the hidden teacher-spending gap highlights many of the existing inequalities in SF and other urban school districts. School Board Commissioner Mark Sanchez in particular along with Commissioner Sarah Lipson have been championing the demand for accountability from our district on teacher salary info by school site and funding inequities in the schools in communities of color or those serving predominantly poor and immigrant students in our SF district. 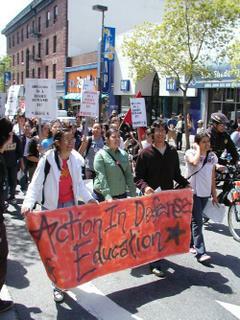 Sanchez and Lipson have also called for a budgeting process that is fair and equitable which addresses the inequities for example between the east side Mission High School which receives over 1/2 a million dollars less than Washington High School because veteran teachers are concentrated in general in west side schools like Washington and Lowell High Schools. CA's November Election will soon be upon us! teachers, students, parents and concerned community activists will be participating in a phone bank at the San Francisco Labor Council. Together we can defeat the Governor. When: September 12-29, Monday through Thursday, 5:00-9:00 p.m.